So it appears nothing has actually changed with the S Pen tech all these years. My N9 pen works(minus bluetooth of course) on all previous notes I still own including the original tablet from 2012. That ancient pen works on the Note 9 as well. Just thought I'd share this bit of info. The only thing that's changed is the sensor density on the screem EMR emitter and the pressure chip on the pen. There's no reason they shouldn't work. lucky. I have multiple s pens from my 8.0 and 10.5 (2012), including the super expensive Samsung s pen with erasure and none have ever worked on my note 8. I have the Note 10.1 tablet and haven't tried the pen on the Note9 phone, but I did try the Note 4 pen on the Note 9 4 and nothing...wouldn't even recognize tapping. Weird. ...But the Note 10 isn't out yet? I still have the Notes 10.1 & 12.2 (tablets), the Notes 3, 4, 5, (had the 7), 8 and 9 (phones). Except for the N9's Bluetooth function and the devices' differing sizes/fit, all of my S Pens have been interchangeable for use. All phone pens' nibs as well (never tried seeing if phone nibs fit tablet pens tho). Not sure why yours wouldn't be interchangeable (function wise) unless maybe the nib needed to be replaced, or the pens or devices were damaged somehow. 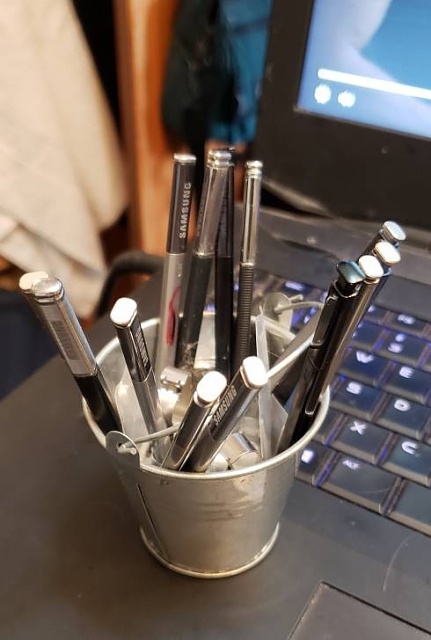 I keep my old & extra pens at my desk, and a few places around my home for when I'm too lazy to take it out of the particular device, lol. Beansr519 and bassplayrguy like this.